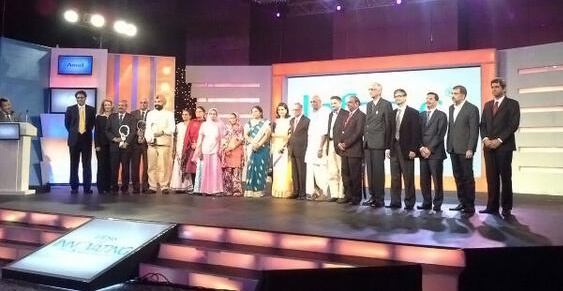 After broadcasting 14 exemplary innovations on the episodic show titled 'Innovating for a Better Tomorrow', CNN-IBN and Infosys held an award ceremony to felicitate the pioneers of these innovations. The Akshaya Patra Foundation, which was one of the 14 select entities, was awarded for its contribution towards making a positive impact on over a million lives in India. The organisation was felicitated alongside other business establishments like Hindustan Unilever, BrahMos Aerospace and social innovations like Narayana Hrudayalaya, Barefoot College, Jain Irrigations and so on. N.R. Narayana Murthy, Co-Founder and Executive Chairman, Infosys, Kiran Karnik, Former Pres ident of NASSCOM and Tessy Thomas, the first ever female scientist to head a missile project in India (Agni-IV) were amongst the dignitaries who presented the awards. The Akshaya Patra Foundation implements the Government mid-day meal programme and provides food to 1,394,757 children across 10 states and 22 locations in India (Click here for details). The organisation is considered a significant social innovation because through the mid-day meal programme it aims to positively impact multiple issues like child health and cognitive development, classroom attendance and enrolment, bridging gaps between different caste groups and communities, uplifting the underserved in the society and empowering women through employment. During the event, Narayana Murthy spoke about the importance of innovation to the underprivileged sections of the society. He highlighted how existing knowledge and resources can be implemented to uplift the lives of the economically disadvantaged. "Societies that have braced innovation have enhanced productivity and grown their economies rapidly. "Innovating for a Better Tomorrow" is our attempt to recognise individuals and groups who have changed thousands of lives with the power of their ideas," he said.